Thinking about adding a new pie to your baking list? Whether its for the holidays or just because, we all have our favorites–but that is no reason why you shouldn’t add another to the list. 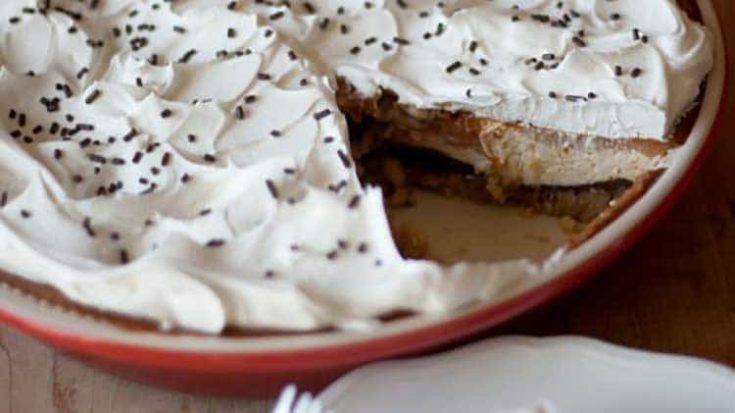 Pie doesn’t have to be an old standard (like pumpkin–no matter how much we love it), it can be a bit different. Or, you can even mix things up a bit and go the absolute no bake route with one of our favorite no bake desserts: Banana Cream Dessert, Snickers Cheesecake Parfaits, and Cool Strawberry Whipped Dessert all make great choices. Here are a couple tips to make sure you’re not stuck in the kitchen for hours cleaning up after dinner is over. Clean dishes as you go. Make sure the dishwasher is empty when you start and load it up throughout the day while you’re cooking. Run it and then empty it out again before dinner. Also keep a sink of soapy water and hand wash some of the dishes as you go. Put pantry staples and kitchen utensils away when you are finished using them. Clear the clutter. Keep the counters clean. Use a soapy washcloth to keep your counters and cutting boards clean between each use. Ready to talk Five Layer Pie? We’re talking Pecan cookie crust, chocolate pudding, cheesecake, and pumpkin all topped off with whipped topping and sprinkles. The sweet flavors blend together so well in our Five Layer Pie, but if you’re into savoring your desserts, you can always eat it layer by sweet simple layer. I’m a big layered dessert fan. If you don’t believe me, why don’t you check out my S’mores Icebox Cake and Banana Cream Dessert? Crush Pecan Shortbread cookies into fine pieces. Melt butter and mix together with cookies. Press down onto bottom of pie dish. Prepare Cook n Serve chocolate pudding according either on stove top or microwave. To microwave, mix milk and pudding together and microwave for 6 minutes in 2 minute increments. Pour over cookie crust. Let firm up slightly while making the next layer. Soften cream cheese and mix together with 2 eggs, sugar and vanilla. Pour over the chocolate pudding layer. Let cheese cake layer firm up for a little while while preparing pumpkin pie layer. Mix together pumpkin, evaporated milk, 2 eggs, sugar and spices until smooth. Pour over the top of cheesecake layer. Bake for 60 minutes until firm and remove from oven to cool. Once the pie is cool, add layer of Cool Whip and chocolate sprinkles. Cover and refrigerate. My favorite pie for the holidays: totally 100% homemade PECAN PIE. Only time of year I eat sweets (diabetic). I have many “favorites” but the one I always go for on Thanksgiving is pecan pie. I love to top off the Thanksgiving meal with a slice of gorgeous Southern Pecan Pie – I’m from New Orleans and I know how to make it! Pecan Pie says Holidays to me. But also? Butterscotch. I love it! what a wonderful looking pie – I would love to win that pie dish. I have two favorite pies in the holiday season – pumpkin is number one of course but I also love pecan pie! thanks so much for hosting this give away! Oh that looks Delish!!!! I LOVE apple pie!!! My favorite pie during the holidays is Sweet Potato Pie! Your recipe looks delicious! Thank you for hosting this giveaway! That pie looks delectable! I love a good pumpkin pie for Thanksgiving, but as soon as Christmas rolls around I need a traditional pecan pie! Cherry! My grandma always made it at the holidays and I miss having it. Oh it is SO hard to pick just one…I would have to go with Pumpkin, but Banana Cream is a VERY close second. Happy Thanksgiving! I am generally partial to cream pies, but during the holidays I can’t get enough sweet potato pie. This pie looks so good! Thanks for sharing with us at Merry Monday. Delicious Pie chocolate and pumpkin can’t never go wrong, that too in cheesecake is amazing, thanks for sharing with Hearth and soul blog hop, pinning.